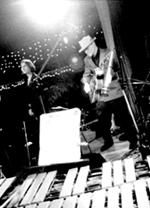 At the Distillery Jazz Festival, featuring vocalist Cal Dodd, May 2004. • Steam Engine (arr. Andrew Jones) FAST SWING. • Nica's Dream (arr., Terry Promane) Latin & Swing; featuring vocalist Andrea Kuzmich (from "Swing's Mistress"). Watch a brief video clip from a Big Steam Band concert featuring Michelle Doyle. 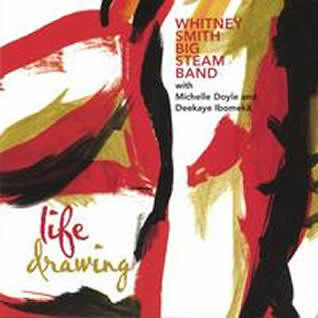 Click here for details on the latest Big Steam Band CD, "Life Drawing,"
featuring Michelle Doyle and Deekaye Ibomeka. Composed and arranged by Whitney Smith. Musicians on the above recordings, pictured below: Jeff King, tenor sax; Steve Crowe, trumpet; Tania Gill, piano; Whitney Smith, guitar; Rob McBride, bass; Jesse Baird, drums. Produced by Whitney Smith. Recorded and mixed by Bryden Baird at the Audio Massage Theatre, Toronto (BB@AMT), Nov. 2002. Andrea Kuzmich, vocals; Jeff King, tenor sax; Tania Gill, piano; Darius Nargawalla, bass; Whitney Smith, guitar; Joel Haynes, drums. Produced by Whitney Smith. Recorded and mixed by BB@AMT, April 2001. 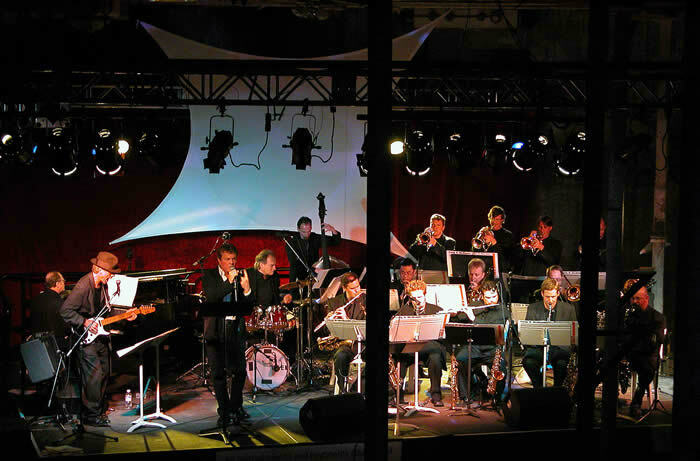 Andrea Kuzmich, vocals; Shawn Nykwist, tenor sax; Jake Wilkinson, trumpet; Mark Hundevad, vibraphone; Whitney Smith, guitar; Jack McFadden, bass; Kevin Coady, drums. Produced by Whitney Smith. Recorded and mixed by Jay Elliot at the Rogue Studios, Toronto, September 2000. Rootsy Americana ballad of restlessness and hope. Available for purchase now on iTunes. Whitney Smith, vocals; Kurt Swinghammer, guitar; Maury LaFoy, bass; Jeff McPherson, drums; Lenny Solomon, violin; Todd Lumley, piano. Recorded and mixed by James Paul at the Rogue. Produced by Kurt Swinghammer and Maury LaFoy. Whitney Smith, piano; Maury LaFoy, bass; Jeff Mandel, drums. Recorded and mixed by James Paul at the Rogue, January 1999. Songs music by Whitney Smith, words by Victor Coleman, except “Colourwise”, words by Whitney Smith and Victor Coleman. * This track used on Big Steam Band album, “Swing’s Mistress,” with guitar. Joel Haynes, drums; Jon Meyer, bass; Whitney Smith, guitar; Jake Wilkinson, trumpet. Produced by Whitney Smith. Executive Producers: Whitney Smith & Carlo Berardinucci. Recorded and mixed by Jeremy Darby at Canterbury Music Co., Toronto, March 25, 2007. • The Magic Word, SAMBA. By Whitney Smith. Melanie Phillipson, vocals; Tien Young, piano; Whitney Smith, guitar. Recorded and mixed by BB@AMT, September 2002. All tracks are available for licensing or purchase (except the first three Big Steam Band tracks) as individual tracks or in EP form (set of 4) by contacting us. Compositions are also available for re-composing, recording or mixing to specific needs. All original tracks may be used for temp scores without permission. Catalogue recordings are composed, arranged and produced by Whitney Smith (unless otherwise noted), registered by SOCAN and currently published by Community Records. Sale of particular publishing rights may be available. Use of recordings written by other composers is subject to permission by their publishers. If you require other music, please contact us. We might already have what you're looking for, or we could make it for you. This excerpt from "The Illustrated Radio" is a two minute selection from a ten minute audio art piece by Whitney Smith, produced as the introduction to the production of "Radio Ghost", a musical shadowplay by Whitney Smith and Victor Coleman that toured across Canada in 1983. "The Illustrated Radio" features the voices of Smith, Coleman and Marien Lewis reading from the Tom Clark poem, "Radio," with music by Steve McCaffery (saxophone), Whitney Smith (guitar) and Jeff Cutler* (drums) and clips from historic radio broadcasts. *Jeff Cutler was the first musician Whitney met. When they grew up next door from each other at 21 and 23 Munro Blvd. in the Toronto suburb of York Mills, Jeff, who was seven years older, was frequently seen loading drums into the back of an automobile. On some occasions while doing this he was seen wearing a purple tuxedo with a pink ruffled shirt. (Some consider that this image of the working musician is to blame for the irrepressible spell that music has exerted on Whitney.) Years later, the two met randomly when "The Illustrated Radio" was being produced and Whitney invited Jeff into the studio to record this track. While chatting between takes Jeff revealed that he no longer owned a purple tuxedo or pink shirt of any kind.